Want to chop carbon emissions for your city, give a boost to transportation safety, and boost accessibility? Think small. 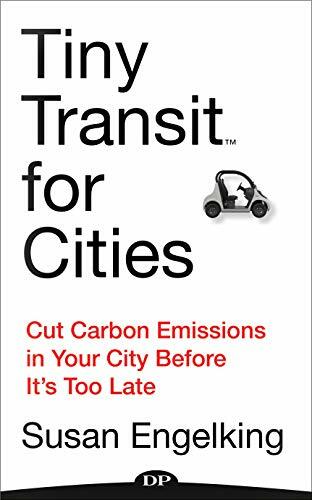 Tiny Transit for Cities is a how-to lead for Councils of Governments (COGs) and Metropolitan Planning Organizations (MPOs) in search of practical ways for their cities to chop carbon emissions. Susan Engelking, founder of Tiny Transit Strategies, describes an innovative, proven solution: safe networks for small, low speed, low cost, low emission vehicles. Tiny Transit is secure, low speed, low cost, low stress, low emission, climate-conscious mobility for this generation and those to come back. For cities, this concept is a game changer. For the nation, this new transportation alternative is a step toward economic resilience, reduced carbon emissions, and energy independence. Don’t stay for your lane.